Figure 1. Gapping Up Doji pattern. This article is devoted to the Gapping Up Doji one-line pattern. The basic candle of the Gapping Up Doji pattern may be any doji candle except Four-Price Doji. Pattern's low price has to be located above the high price of the previous candle. The pattern has to appear in an uptrend as only then may predict its continuation. It is recommended to wait for a signal confirmation on the subsequent candles. 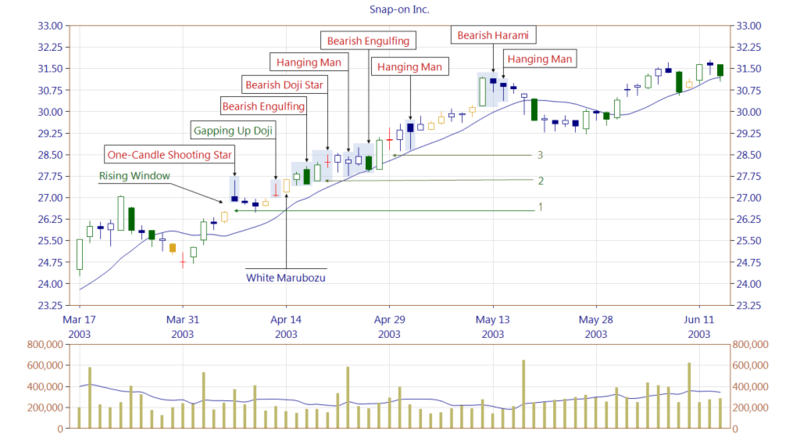 Especially that Gapping Up Doji pattern can occur as a second line in other composed of several lines bearish reversal patterns, such as Bearish Doji Star, Bearish Abandoned Baby. Gapping Up Doji is a pattern which rarely occurs. Figure 2. The occurrence of Gapping Up Doji pattern took place after the market defense and overcoming resistance zone that was created by three black candles before the Rising Window pattern occurrence. Rising Window formed a support area. Until the black candles occurred, the market has reached 40% of the profit (from the price of $12.00 to $16.80). The day after the Gapping Up Doji appeared, and the Bearish Engulfing pattern was formed. 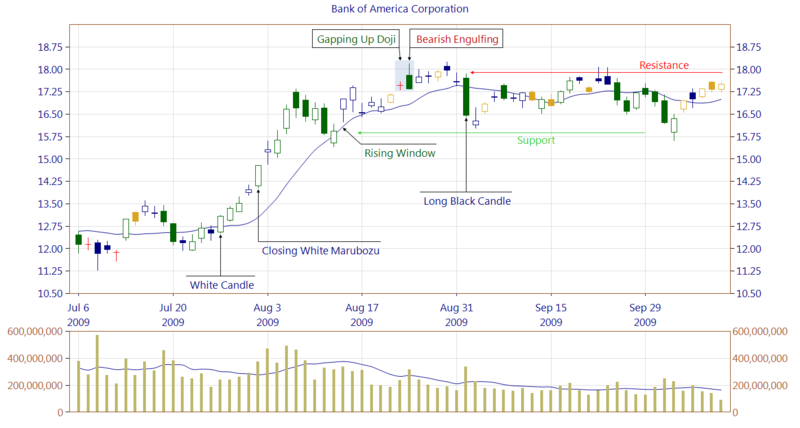 Its first line is a doji candle and has a very strong significance. The occurrence of Bearish Engulfing pattern is accompanied by a large trading volume, which confirms its strength. The market is still trying to defend itself. However four days later, after a Bearish Engulfing pattern occurred, the Long Black Candle is formed at a very high trading volume, and the resistance zone is established. Market turn into sideways trend. Figure 3. The occurrence of Rising Window along with the One-Candle Shooting Star is a very typical situation. It proves the principle that to confirm a prediction of the pattern, one should wait at least one candle, sometimes more, to obtain more information about what is happening in the market. Support area created by the Rising Window (arrow 1), was defended in the next few days after the occurrence of One-Candle Shooting Star pattern. Then, the market received the information in the form of a Gapping Up Doji, which is a bullish continuation pattern. White Marubozu candle appears reaching new maximum. The weakness can be found however in the low trading volume that is below average. Then Bearish Engulfing pattern occurs, which is canceled the next day (arrow 2). It may be considered as the strength of the bulls wanting continue the more and more visible uptrend. The bears do not give up and there are three patterns following each other that are predicting the downtrend: Bearish Doji Star, Hanging Man and Bearish Engulfing. However, they do not have the confirmation as they cannot beat the white candle (arrow 2). The increase in trading volume can be noticed. The next white candle appears (arrow 3), which forms the support zone. When looking on the chart, the question immediately arises: how is it possible that having so many instances of the bearish reversal patterns it was necessary to wait until a Bearish Harami occurred to stop the uptrend. The detailed analysis “day after day” shows that such a scenario is possible if the market can defend its position. 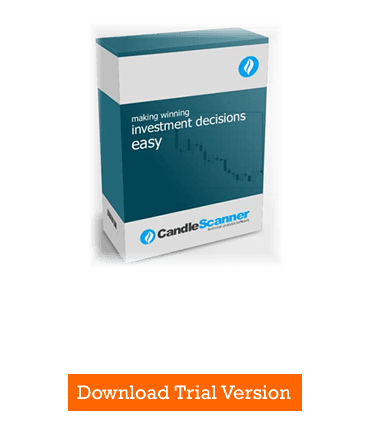 Below you can find some Gapping Up Doji pattern statistics calculated by CandleScanner software. To see more detailed statistics, for other markets and periodicity try our CandleScanner software. Prices start at only $10, and you can see more detailed statistics, for other markets and periodicity. Click here to find out more!